When the local trash collector recognizes a man he knew as a child, but can clearly see this man has never grown old, he decides to confront him during one of his local rounds. This young man is clearly rattled by the trash collector and finds it difficult to persuade him otherwise. When the young man walks back inside his home, he sees his new life here and then recalls the old ones that came before. 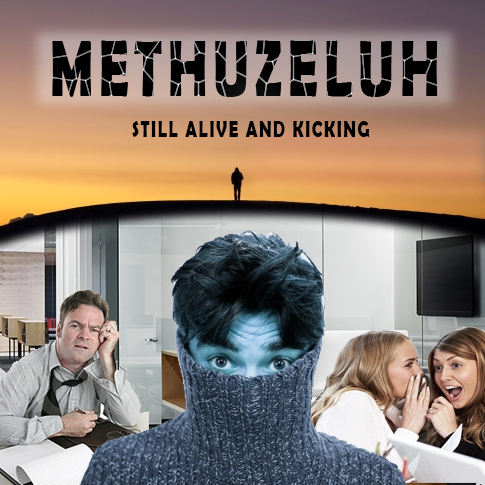 He is Methuzeluh, from the bible. He did not really ascend to heaven but instead found himself back among the living, for what purpose he has yet to know. His current life as an urban office worker has provided the least amount of responsibility with the greatest degree of reward, when confronted by the trash collector, the guilt he has acquired over many lifetimes, for failures large and small, for not knowing why God gave him such a long life without well defined purpose or mission. He decides that he should do something about it and face the consequences, whatever they may be. The next week the trash collector shows on his regular rounds, however, this time he is accompanied by a local news crew that has come ready to report a joke story, but finds themselves in a quandary when the young man openly admits he is Methuzeluh from the bible and is able to make a historical reference only a scholar might know. The news crew leaves confused and skeptical, but turn in the story which is aired that night. The next day Methuzeluh comes to work at his office job. Everyone is gossiping and asking questions, the boss is worried about his mental health as well as the woman that has a passion for him. This all changes when a Biblical Scholar who happened to see the broadcast, contacts the station and is able to verify Methuzeluh’s story. When Methuzeluh arrives home from work, his place is surrounded by reporters anxious to get an interview or story. After making his way in, Methuzeluh contacts his love interest and asks for help, she has it out with him but decides to help him out by letting him hide at her place. As he’s talking, he sees some things she has left there, shoes and make up, he asks, “what size shoes do you wear?”. Methuzeluh finds his old robes from the past and puts together a disguise so he looks like an woman. He is able to get past the media waiting outside and over to his lady friend’s house. Methuzeluh tells her the whole story with all it’s biblical implications. She’s a bit star struck, but is still angry he has deceived her all this time, what if she got pregnant and had some kind of biblical baby? What kind of life would it have? How many other wives has he had or children, then she becomes angry at herself, makes him sleep on the couch. The next morning they both report to the office which is overwhelmed with people asking questions, religious fanatics, protesters and police. The boss is surprisingly please with all the publicity and is hoping it will improve his bottom line, asks Methuzeluh to please put in a good word for him on the television and also to the big man upstairs. Methuzeluh decides to go on television for an interview, but insists it be someone benign, with no ulterior motives, Ellen, why not. She doesn’t want to do it and has no idea what to ask him, but that’s why she’s perfect. When he finally shows up and appears on her show, she asks him straight out how old he really is, to which he will admit only 3,000 years as any more than that may stereotype him as “old”. He admits to her that he does not know how he has managed to live so long without injury or accident, illness or world destruction. He does know the value of a human life, having seen so many come and go, for so many reasons. The endless voices he has memorized and loved, the value of knowing the value of a life lived in the betterment of all. As he speaks he begins to realize what the purpose is for his long existence. It is this world wide admission that touches the heart of every person that hears it. However, Methuzulah’s troubles are not over, he is accused of being a fraud and arrested. His bail is set too high, but Gabriel Bail Bonds comes out of nowhere and brings him home. The bail bondsman, Gabriel, advises Methuzeluh to stick to his story and have faith. As he sits contemplating his future, someone from his past knocks on his door. Two elderly British pilots who he helped escape from Morocco during the great war were standing there. They had discovered who he was at that time, never divulged his identity as it was not only unbelievable, but it was allowed him to bring them to safety. They had come to pay back the favor and prove his identity. More evidence appears from historians able to find his image from the past. As his story becomes more believable, so grow the people supporting him and his charges are finally dismissed someone sees his pocket watch in a photo from an Old West Museum. After being vindicated he finds himself with Ellen, who asks him to compare the women of today to the women of yesterday. He declines offering that if there is one thing he’s learned in all this time, women create civilization. Women are the civil mind among us, they have the kids. Any society would be judged best by how they treat their women, children and animals. When Methuzeluh finally arrives home, his lady friend is there. She has been overwhelmed by his words and is no longer fearful of him. As they are ready to kiss and re unite, there is a knock on the door. It’s the IRS, they want to know where his tax return is for 1953.